Cat medicine can be confusing. 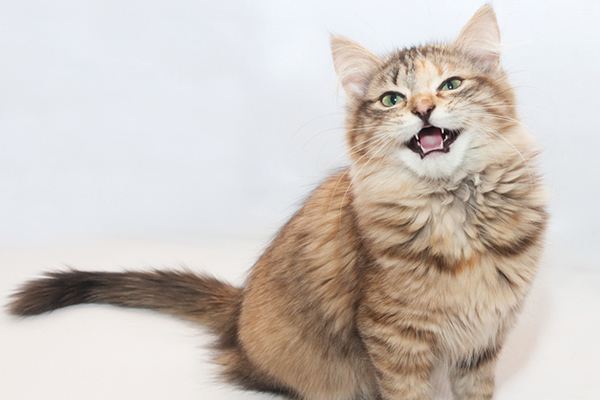 We break it down to the seven most commonly used feline medications, plus holistic remedies. This may seem obvious, but cats are neither small humans nor small dogs. Although we use many of the same medications, cats are much more sensitive to many of these substances. Even our over-the-counter medications can be dangerous to cats if administered incorrectly. When it comes to medication, dosing and frequency of use can make the difference between life and death, so always consult your veterinarian before using any sort of cat medicine. Most of these medications are classified with the prefix “anti” in the name. That’s because they fight against things like parasites, bacteria, fungi, protozoa, viruses and painful inflammation. Here is a brief look at some cat medicine that’s most commonly used by feline veterinarians. 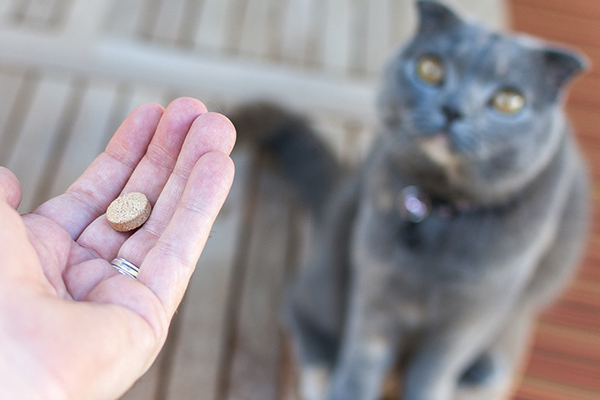 Cat medicine can be confusing — our guide breaks it down! Photography ©talipcubukcu | Getty Images. Antiparasitics are used to treat internal parasites such as tapeworms and Giardia, and external parasites such as fleas. Some can also prevent heartworm infections. Fleas are perhaps the most formidable nemesis to cats. They can jump onto us from the outdoors and jump onto our pets when we come inside. And they’re strong little buggers. Have you ever tried to squash one? They bounce back. An infestation can cause such severe anemia in a kitten that it could be fatal, and a cat that swallows one while grooming can end up with tapeworms. Female fleas can spawn 50 eggs a day and produce as many as 500 eggs over their life span. Fortunately, antiparasitics have come a long way in the past few years, giving cats oral flea control, like Comfortis, that work over their entire bodies. Available by prescription in a chewable tablet, Comfortis begins working in 30 minutes and prevents infestations for 30 days. For pregnant cats and kittens at least 4 weeks old and over 2 pounds, Capstar comes in pill form and is considered safe. Capstar treats an existing flea infestation but is not used as a preventive. This medication kills fleas within four hours and provides 24 hours of protection. Program Flea Killer for Cats is a preventive available in flavored tablets and liquid. This medication interrupts the flea life cycle at every growth stage. Administered at the beginning of flea season, the dosage is based upon weight and prevents fleas for one month. Laxatone-type gels, often flavored, lubricate the cat’s digestive tract to help hairballs pass through and prevent future hairballs from forming. Because many of these are petroleum based, some veterinarians discourage their use. Natural formulas that don’t use petroleum are also available as well as special diets, treats and supplements. 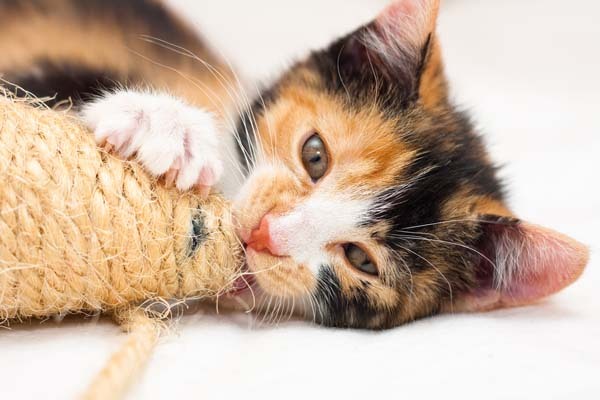 Capilex is a chewable that works by removing the fat from the hairball, thus shrinking it and allowing it to pass, explains Gary Norsworthy, DVM, a board-certified feline specialist who owns the Alamo Feline Health Center in San Antonio. 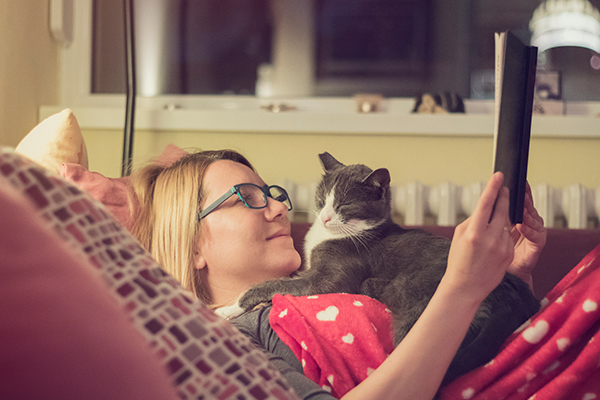 With more than 40 years’ experience and seven textbooks to his name, Dr. Norsworthy led a groundbreaking study that showed frequent hairballs warrant a veterinary visit, because an underlying illness that needs to be treated could be the cause. Antibiotics destroy bacteria, prevent them from reproducing and starve them by blocking glucose, which living organisms convert into energy. The fluoroquinolones, including Baytril, Zeniquin, Orbax and Veraflox are among the most broad-spectrum and safe antibiotics available, Dr. Norsworthy says. These are given orally for respiratory, skin and urinary tract infections. Amoxicillin/clavulanic acid, used for respiratory infections, wounds and skin infections, is especially good for cat-fight abscesses, Dr. Norsworthy says. “Convenia is an injectable that lasts up to two weeks. It is very good for skin, cat fight and oral infections.” Other antibiotics include metronidazole, which is used for gastrointestinal upsets and periodontal disease, and clindamycin, which is used for soft tissue, bone and dental infections. Antiprotozoal antibiotics kill protozoa either directly, by destroying their DNA or by inhibiting cell growth and reproduction. Metronidazole, for example, is in the antibiotic class, but it’s also effective against Giardia, a protozoan. Antifungals destroy fungus in different ways and treat both internal and external fungal infections. Griseofulvin treats skin-level fungal infections, especially ringworm. Although antivirals cannot kill viruses like feline herpes and calici, in some cases these drugs can stop them from reproducing so that they die off on their own. Antihistamines fall into one of two categories: H1 and H2. Non-drowsy H2 antihistamines are a newer category known for their non-sedating effects. The problem with H2 antihistamines is that they’ve been shown to be ineffective in dogs and cats, even though they are popular among humans for their efficacy and non-drowsy effects. 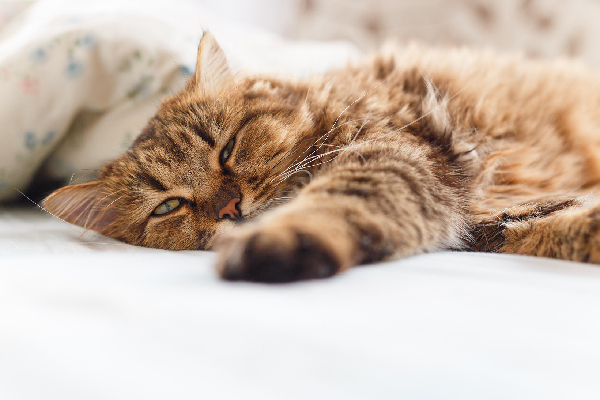 Veterinarians prefer to use the H1 antihistamines like diphenhydramine (commonly known as Benadryl), clemastine fumarate and chlorpheniramine in cats to relieve allergic reactions such as excessive itching. The most common side effects are drowsiness and dry mouth. Anti-emetics, also known as anti-vomiting and anti-nausea drugs, relieve nausea and prevent vomiting. This is a large category in medicine, because disease, injury and surgery cause pain and negatively impact quality of life. Several drug classes are used to relieve pain. Non-steroidal anti-inflammatories (NSAIDS) like ibuprofen, some of which are over-the-counter, are human medications that can be lethally toxic to cats. Non-NSAID pain relievers like acetaminophen are also extremely toxic and lethal to cats. The NSAID aspirin is sometimes given in pill or liquid form in small doses, but this also can be dangerous if given in too high a quantity or too frequently. “It should only be given every three to four days and then at a dose of 5 mg/cat or 40 mg/cat, depending on the condition being treated,” Dr. Norsworthy says. Don’t give aspirin on your own unless your vet examines your cat and prescribes it, and then follow dosing and frequency instructions. 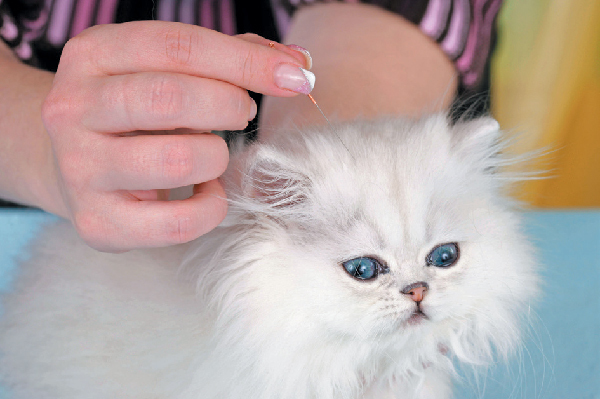 Acupuncture is a holistic pain reliever for cats. Photography ©Juniors Bildarchiv GmbH | Alamy Photo. Holistic remedies focus on preventing problems and maintaining health. That starts with a healthy diet. An all-natural, high-protein diet can keep bodily systems functioning properly, and a healthy cat’s immune system will ward off many ailments. 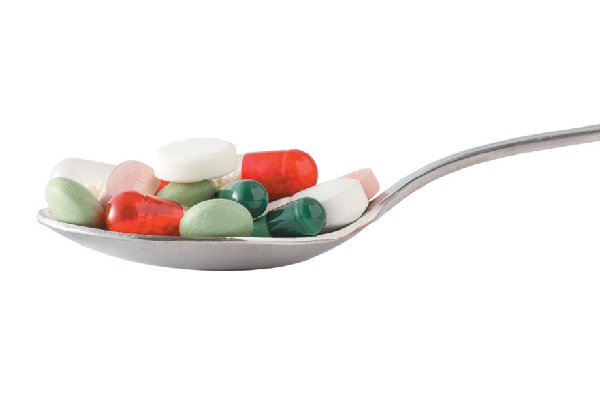 Supplements can target specific conditions. Since some side effects are associated with supplements, and they can interact with medications, it’s always best to consult your vet before giving any supplements to your cat. Some veterinarians give glucosamine supplements to cats to relieve joint pain due to arthritis. Unsweetened cranberry juice or cranberry supplements can prevent urinary tract infections and are recommended for cats who are prone to them. Some cat treats contain cranberries to promote urinary health. Unseasoned pumpkin puree, not the pie filling, has long been a home remedy for cats to alleviate constipation and diarrhea. For holistic pain relief, acupuncture has perhaps the best track record for safety and efficacy, and some veterinarians offer it. The practitioner inserts tiny needles at different points of the body to release blockages and create the normal flow of blood and energy. Hemp-derived CBD oil for pets is one of the latest holistic pain relief products to come out, so it’s another possible option to discuss with your veterinarian. By using a little manual supplementation, you can prevent hairballs by brushing your cat daily to reduce the number of hairs she swallows while grooming. Holistic flea control begins with a flea comb. The comb removes both fleas and flea dirt, but it can’t handle an infestation, and then you have the challenge of killing the fleas. Fleas have to be drowned, so bathe your cat in a mild cat shampoo. Vacuuming also has been shown to kill fleas, so vacuum your home often. Limit your cat’s outdoor exposure, but also treat the outdoor environment so fleas don’t hitch a ride on you into the house. Nematodes are parasites that feed on fleas and other insects. You can think of it as fighting nature with nature. You can find nematode yard treatments at garden stores. Susan Logan-McCracken is an award-winning author who specializes in pet and human health topics. She and her husband are parents to two adorable red tabbies.